Grant McCann believes his Doncaster United side dominated his former club as he returned to Peterborough United for the first time since being sacked as manager. Club legend McCann made 185 appearances for Posh before returning as the boss, but he was let go last season with the club 10th in League One. 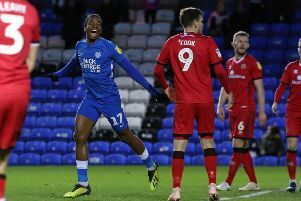 Doncaster came into today’s match in seventh place and became the first team this season to stop Posh from winning a league fixture after Posh had won a club record five matches at the start of a campaign. But McCann was hugely frustrated that his new employers did not take home all three points from the ABAX Stadium. He said: “I thought it was an excellent performance from us. I thought we were the best team for 90 minutes. Maybe there was a five minute spell where they scored and were on top of us for a bit. “They couldn’t live with us really. Our movement, our passing - we controlled the game. We got one goal and we should probably have had four or five. “We nullified the threat very, very easily. We pushed the full-backs up on the wide players and stopped their counter attacks. We stayed on the front foot. I thought technically we were better. The Northern Irishman was also pleased to receive a good reception from both sets of fans after the full-time whistle had been blown. He added: “I had seven or eight really good years here. It’s a club that will always be close to my heart for what they’ve done for me. Darragh MacAnthony, Barry Fry, Bob Symns, Liz Elsom. I could name them all. I have some really good friends here and I had a nice reception from the fans at the end which was nice.